One Momma Saving Money: FandangoNOW: Rent Star Trek Into Darkness & Star Trek (2009) for ONLY 49¢ each!!!!!! 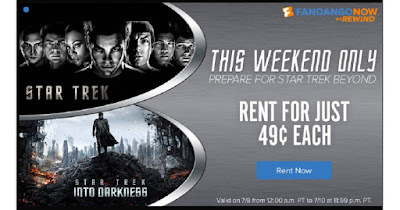 FandangoNOW: Rent Star Trek Into Darkness & Star Trek (2009) for ONLY 49¢ each!!!!! !